The Google Voice app just received another update this evening, bumping it to version 4.2.34 and bringing a very short (but welcome) change log -- tablet support. We've seen just how easy it is to sideload the app onto your tablet, and plenty of folks noticed the way the action bar looks more tablet-like in the update a few days ago, but now it's more official with it sitting right in the Market, waiting for you to download it. So get to it -- link is after the break. That’s right, folks. 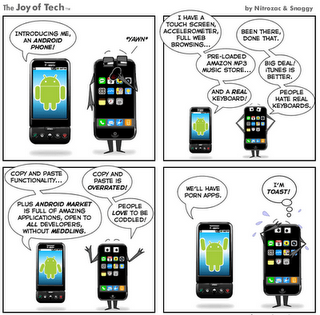 Tonight’s your lucky night if you’re a Droid 2 user. 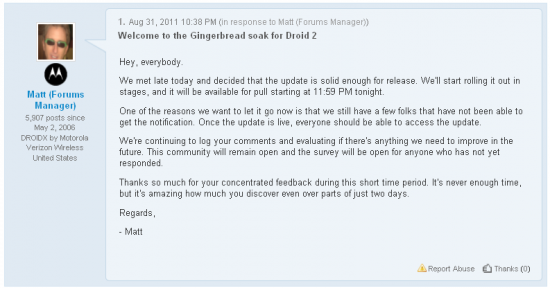 Seems the Gingerbread soak test for the Motorola Droid 2 went over well seeing how Moto is to begin rolling out the tasty Android treat for the masses starting tonight at 11:59PM. This will bring your device up to Android 2.3.3 and all the Gingerbread goodies that come along with it. Are you guys as hyped about this as I am (and I don’t even own the device)? As always make sure your phone is fully charged and don’t forget to leave a comment once the update is pushed to your device! Good luck and godspeed. Today, I give you a little, but useful tip which could save you a bunch of time while searching for apps. Instead of opening up the Android Marketplace to search for an app, use the Google search widget. Set the Google search widget to search the Android marketplace, and all you have to do to search for an app is type in the app name and press the search button. If you are on a slow mobile connection, you will save a few seconds as you will skip the featured apps homepage which can take forever to load. You might only save a few seconds each time but those seconds will soon add up into a decent amount of time if you search for apps as often as me. This article was based on the AndroidPolice article which suggests that you press the physical search button on your device instead of searching for an app directly in the Marketplace. How to manage your Android contacts?